Burn CD+G discs on your computer. Save (rip) CD+G songs to your hard disc. Power CD+G Burner is all-in-one software for karaoke CD disc burning and ripping. 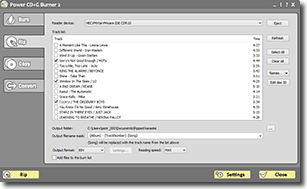 Power CD+G Burner 2 software allows you to burn CD+G (BIN, CDG, MP3G, ZIP, KMA, and MCG) songs on regular CD/DVD drives. With our karaoke burner program you can save CD+G tracks to your hard disc (in MP3G and ZIP formats) and copy karaoke CD with a single mouse click. Burn CD+G discs from your PC. Create CD+G discs using music downloaded from the Internet. Convert CD+G discs to digital format. Change the key of karaoke songs before burning them. Convert between a variety of different file formats. 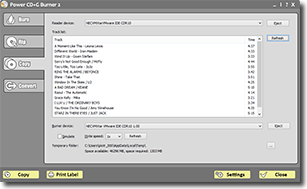 Burning CD+G songs has never been so quick and easy - simply select the files you would like to burn and click a button. That's it! No messing with multiple tools - just click and go! Stop wasting time on encoding, interleaving, converting, and burning. Stop wasting money on additional third party software. Power CD+G Burner 2 is everything you require to write, read, and rip CD+Gs. Burn BIN, MP3G, ZIP, KMA and MCG files. Drag-and-drop to add files to a compilation. Change the key of a song before burning. Normalize audio tracks when creating compilation so they are equally loud. Rip CD+Gs as BIN, MP3G, ZIP, and CDG + WAV files. Copy karaoke discs with one mouse click. FreeDB online database lookup allows song and artist names information to be applied to many CDs. Built-in label printer for CD case labels. 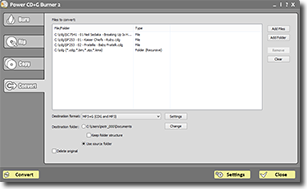 File converter changes formats of entire directory trees. Handles MP3G, ZIP, BIN, KMA and MCG. Works with most modern CD or DVD burners. Small technical print: Your drive has to be MMC compatible with support for DAO/96, 99% of them do. Power CD+G Burner 2 costs $39 USD. Current owners of other Power Karaoke programs can get Power CD+G Burner for $29.